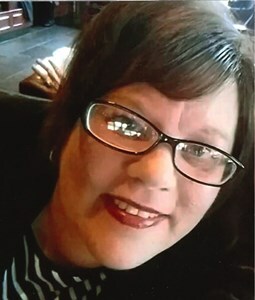 Lisa Ann Frazier, 45, of Clarksville, Indiana, passed away on Monday, January 14, 2019. Lisa was a proud Christian who loved her faith in Jesus Christ. She loved music, singing, and dancing. Lisa loved being with friends and family, but especially loved being a Nana to her granddaughter. She was born on April 22, 1973, in New Albany, Indiana, to Delores (Miller) Frazier and Ralph Frazier. Along with her parents, Lisa is survived by her sons, Brandon Frazier and Ryan Dixon; siblings, Angie Denzik, Ginger Baxter (Mark), and Chuck Frazier; granddaughter, Kaylie Jean Frazier; and nieces and nephews, Randy, Haley, Alyssa, Drew, and Olivia. Memorial Visitation will be from 4:00 p.m. to 8:00 p.m. on Tuesday, January 22, 2019, at Newcomer Cremations, Funerals & Receptions - New Albany. Her Celebration of Life Service will be held at a later date. The family requests that contributions in Lisa ’s memory be made to Jews for Jesus (60 Haight Street, San Francisco, CA 94102). To leave a special message for the family, please click on "Share Memories" icon at the top of the page. Add your memories to the guest book of Lisa Frazier. Memories of 3 beautiful girls I lived 2 doors down from, ( Chuck) u were the best present I think they could of had. Pizza Rolls and giggles. Babysitting you girls was my first gig, and I enjoyed it so much. Moving at 13 from Tupelo Drive I missed all of you growing up, however never forgetting your family, and the bond all of you shared. My thoughts and prayers are with you at this time and I know you all will be together as a close loving family, that no bond can cut?? Last memory I’ll cherish as I stood beside you w/Angie (big sis) I said look at the silver how they shine! She hushed me lol Don’t tell her that I was suppose to fix her hair! Strands of Glory! Lined in Glory! I will forever cherish the life long friendship and sisterhood. As you said yourself on our trip it’s like we never lost contact and we had so much to catch up on and we did and we had a great time even thou! You wouldn’t let me play too much country music before you’d switch it up! You’d say I can just feel the beat it comes natural that it does! Love to hear you sing and sing w/you and Angie. My promise to you now is I’ll keep listening & singing always and forever thinking of you and stand beside Angie to leave no stone left unturned. What a beautiful angel. You are dancing in the beautiful clouds of heaven where I know you are forever free! -free bird- & -I will always love you- much love sissy Faye’ (from another lol) hearts & lots of music! My thoughts and prayers are with each family member. May God comfort as only he can. I can see Lisa as a little blonde girl running around old church. May your memories fill the void till you all meet again. Praying for God's peace and comfort for you and your family. We were the two youngest granddaughters on the Frazier side. During the summers at my parents house, we always were paired to sleep together no matter if was the floor or a bed. That time you cleaned my room for a penny.... 2 Live Crew tapes. I just regret not staying in touch as we became older. You will forever be in my heart. I remember my sister and I along with Lisa, Angie, and Ginger took piano lessons for a few years. We would write notes to each other on the covers of the coloring books that were there, as we waited for the person in front of us to get done. Then we couldn't wait til the next week so we could read what they wrote us back. Lisa you had the most beautiful walk of faith in Christ more than anybody I ever knew. I can't ask you to forgive me now, but I know you will be smiling down on me. I will cherish the good times and laughs we had together and carry on all the many things you taught me. Lisa I will see you again in heaven and will need you to hit me upside my big ole head with your crown. Love you always and forever, Billy.....Micah 7:8 will always be our verse. I know Lisa is in Heaven now smiling down at all of us. I will always remember with a smile the times you would sing "Moon River" as a little girl. You were so happy and full of energy dancing around. I know you are dancing and singing in Heaven. I love you! Lisa is gone much too soon. But she is a much better place. We will continue to pray for her family. May you find comfort in Jesus at this time of sorrow. I will miss you, my beautiful cousin! I always loved the cd you sent to me! You lightened up my life with your sunshine! Condolences to my beautiful family! I love you all so very much! God bless you all! Lisa Your Mom,Dad,Big Sisters,Baby Brother,Boys,Grandbaby,Nieces and Nephews,Brother in Laws and all extended family Miss You beyond measure! Hope Heaven is As Beautiful as You! We Love You Always!